FirstPromoter allows you to track your affiliates and influencers by both referral links and promo codes(like discount coupons), when referral links are not allowed, for example in Instagram. Promo code tracking works only if you can give discounts or other offers to promoter friends or followers. Note: We don't apply the discounts and other offers like free months automatically, you need to have a coupon/promo code field on your payment/subscription page. Promo codes set at the campaign level which are visible to all affiliates running the campaign. Since they are not unique(all affiliates share the same coupon) they can't be used for tracking, affiliates can share them together with the affiliate links as a way to encourage the sale. We won't talk about them in this article. 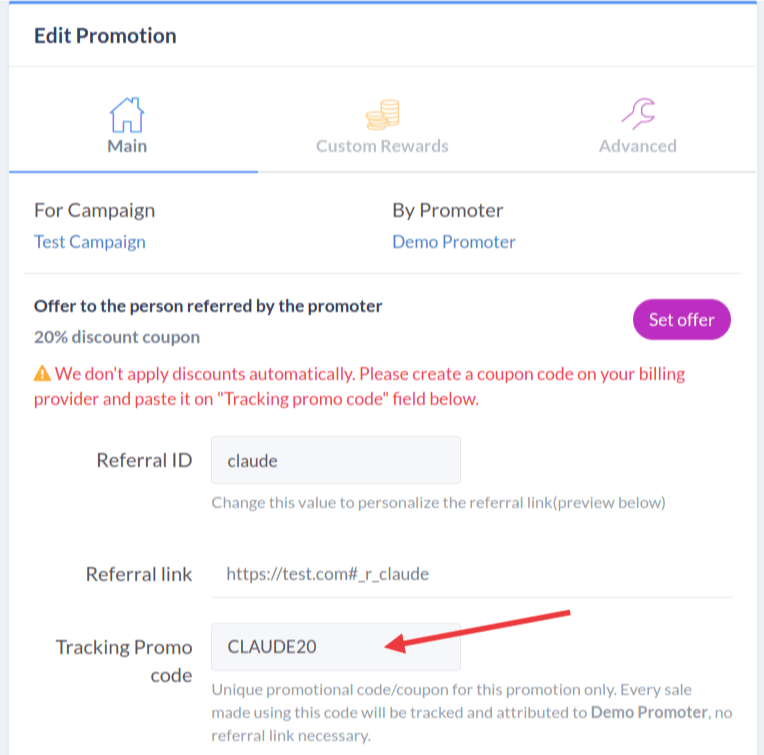 Unique promo codes set at the promotion level which are unique for each promotion and can be used for tracking and shared without the referral link. Make sure you set an offer for the campaign or for the promotion. When you click "Set offer" and select "discount", you'll see a box named "Promo code". You're not required to fill that box...filling that box will set up a "campaign level" promo code visible to all affiliates not a tracking one. Go to Promotions section and click "Set promo code" on the promotion that corresponds to your promoter. If you don't see 'Set promo code', click on the menu icon(3 horizontal bars) and select 'Edit promotion'. Go to your billing provider and create a coupon code. We recommend to personalize it with the promoter name like "CLAUDE20". Back at FirstPromoter, enter the promo code in the "Tracking Promo Code" field. Be careful. Make sure that you haven't entered that promo code on another promotion, it has to be unique to each promotion, otherwise FP won't be able to track the sales correctly.